NEW YORK, N.Y. - The NL East-leading New York Mets acquired reliever Addison Reed from Arizona for two minor league pitchers Sunday, completing a trade they hope will bolster their late-inning bullpen. Reed is expected to join the Mets on Monday when they play Philadelphia. 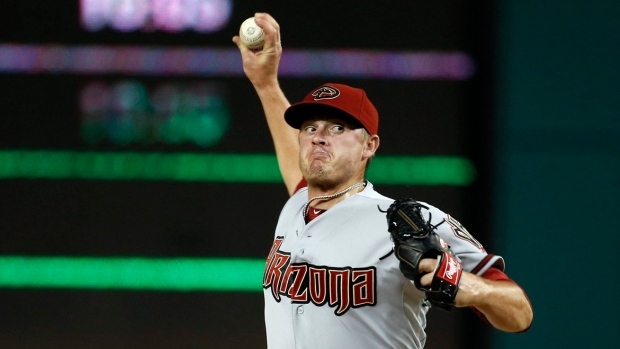 New York sent right-handers Miller Diaz and Matt Koch to the Diamondbacks. The 26-year-old Reed, a former closer, was 2-2 with a 4.20 ERA in 38 games for Arizona this year. Demoted to the minors to work on mechanical issues after struggling, he returned a month later in late July and gave up three runs in 16 1-3 innings with 14 strikeouts. "You're talking about an experienced major league pitcher who had a little bit of a rough start this year. But the last three weeks he's pitched very, very well," Mets manager Terry Collins said. "He's going to give us another quality arm at the back end of the bullpen. Hopefully he's that seventh-inning guy we've been searching for." Reed saved 32 games for Arizona last year and 40 for the Chicago White Sox in 2013. Though he's right-handed, Reed has done better against lefty batters this year — they're hitting only .219 off him. "If he gets outs, it'd mean a lot to the team," Collins said. "We're tired. Our bullpen is out of gas." New York, absent from the playoffs since 2006, acquired setup man Tyler Clippard and lefty reliever Eric O'Flaherty earlier this summer. The Mets have their closer in Jeurys Familia, but lacked a reliable arm to work the seventh. Because he was traded before Aug. 31, Reed would be eligible to pitch for the Mets in the post-season if they make it. In the clubhouse after Arizona's 3-2 loss to Oakland on Saturday night, Reed said he didn't know anything official about a trade, although he was aware of media reports that he might be going to the Mets. "Obviously, that would be awesome," he said. "Don't get me wrong, I love it here, but they (the Mets) are 5 1/2 games, six games up. That would be awesome to go over there and help the team with the ultimate goal of getting a ring. That's my ultimate goal before I'm done playing. I want to get to the World Series. If that happens this year, that would be awesome." Hours before Sunday's game, Reed had already cleaned out his locker and was gone from the Arizona clubhouse. Reed is under team control through 2017. He filed for arbitration last off-season and is making $4,875,000 this year. He will be eligible for arbitration again next year. The 23-year-old Diaz was 5-12 with a 4.71 ERA at Class A St. Lucie. The 24-year-old Koch, a third-round draft pick out of Louisville in 2012, was 4-8 with a 3.46 ERA for Double-A Binghamton. Koch began the season as a starter, then went to the bullpen for a long stretch before returning to the rotation in August. He pitched seven shutout innings of three-hit ball Friday night against New Hampshire. Koch thanked the Mets in a post on Twitter. "It's been a blast. Excited about the new opportunity with a new organization," he wrote. For the Diamondbacks, dealing Reed was made easier with the emergence of right-hander Silvino Bracho, called up Sunday from Double-A Mobile. The 23-year-old Bracho was 2-1 with 19 saves combined at Class A and Double-A. He had 71 strikeouts and 10 walks in 42 games. "Number one, Bracho has pitched his way to the big leagues. He's a guy that everybody in the system raves about and has trust in," manager Chip Hale said in Phoenix. "Number two, when Stew (general manager Dave Stewart) is approached about all these people that these teams want, he has a certain list of names with a priority, and these guys that he got in the trade were at the top of that list." Hale appreciated Reed's professionalism when it came to being sent down to Triple-A, where he appeared in 11 games during June and July. "For a guy that has so many saves in the major leagues, he understood his situation. He went down there and he took care of business. He came back and he pitched beautifully for us," Hale said. "We hope that he has a really great time at the end of the year here with the Mets and an exciting pennant race for them." To make room for Reed, the Mets optioned right-hander Logan Verrett to Triple-A Las Vegas. They also recalled infielder Wilfredo Tovar and put him on the 60-day disabled list, clearing a spot for Reed on the 40-man roster. AP freelancer Jose Romero in Phoenix contributed to this report.